Working together for the benefit of people and planet! 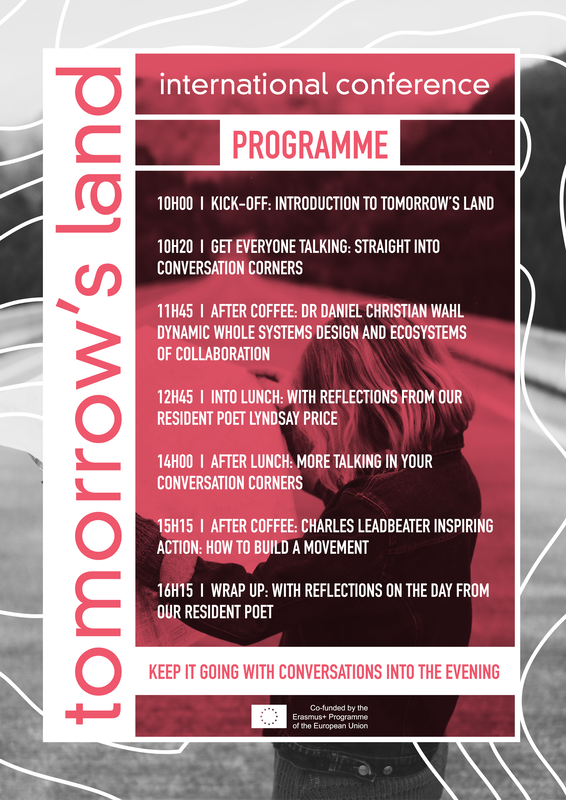 Co-funded by the Erasmus+ Programme of the European Union, the 6 partners have worked collaboratively to design the Tomorrow´s Land journey to inspire and guide future social innovators to build of a better, more inclusive and innovative society. We invite current and future social innovators; social entrepreneurs; trainers, teachers and educators, business advisors, networkers and policy makers, in fact…anyone who wants to open up their mind to new possibilities, to design and shape social innovations to solve some of the challenges we face and collaborate to create a brighter future. Join us to get thinking creatively, connecting and plotting to create new solutions for a better world. Join us for a full day of reflection, sharing and lively discussions on social innovation and collaborative economies. ​Take a look at who is who here. We want to share the Tomorrow’s Land journey with the world so this is a free conference. Please follow this link to complete the registration process.